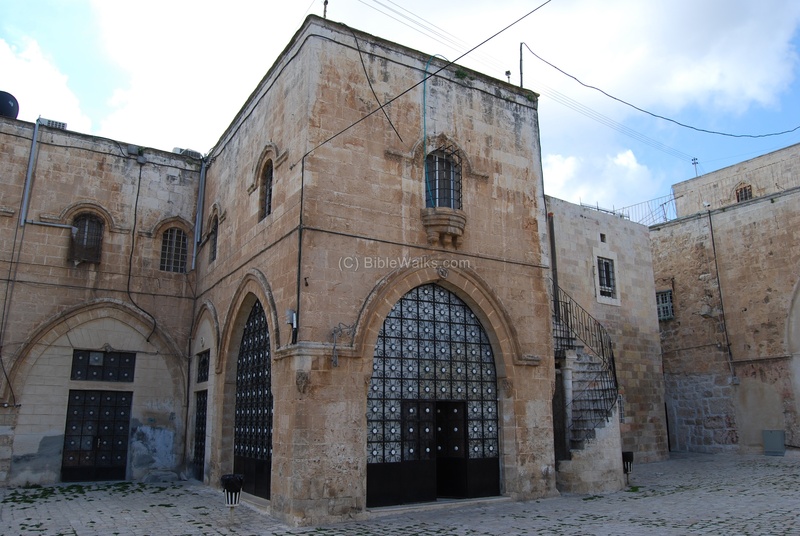 A Basilica, monastery, library and structures belonging to the Armenian Patriarchate, located on the western side of the old city. According to tradition, James the apostle was killed here by Herod. Acts 12:2: "And he killed James the brother of John with the sword"
St James church in the Armenian sector is dedicated to the two James: James "the Great", one of the apostles of Jesus and the brother of John, and James "the Less", the brother of Jesus and the first bishop of the Christian community in Jerusalem. According to Armenian tradition, their church was built at the site where James the great was killed by King Herod Agrippa I in 44AD (Acts 12:2): "And he killed James the brother of John with the sword". 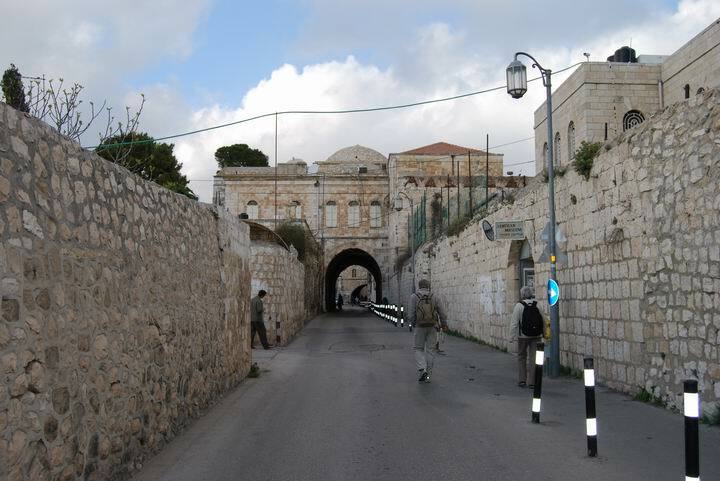 At the times of Jesus the area was part of the "upper city", located on the western side of Jerusalem. Armenians: In the first Century the Christian apostles, Bartholomew and Thaddeus, came to Armenia (a land east of modern Turkey) to spread the faith. The transition from paganism to Christianity was a long process, about 200 years. In 301 Saint Gregory the Illuminator (257-331) was successful in receiving a royal acceptance to the conversion of the nation, and so the Armenians were the first country to adapt Christianity as their official religion. 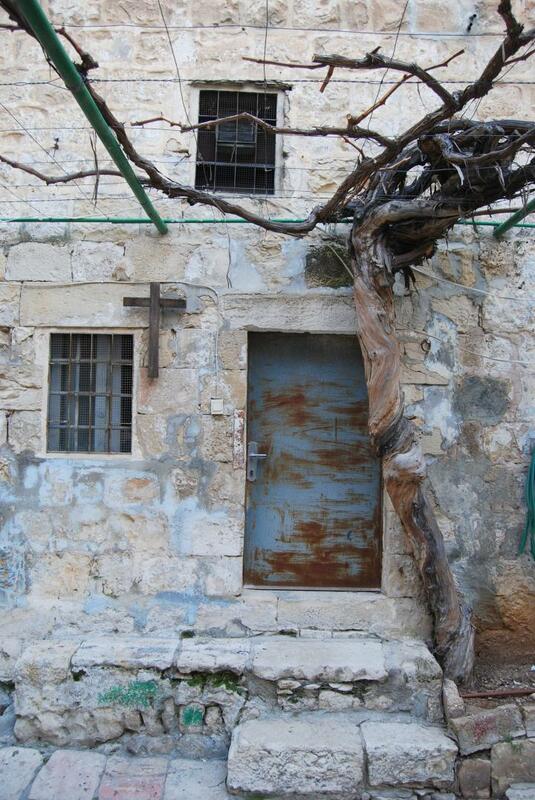 The Armenians were among the first Byzantine monks in the Holy Land. Euthymius (also: Euthemius, 377-473) was one of the most prominent fathers of the Judean Desert Monasticism, and often called "St Euthymius the Great". During the 6th Century a Byzantine church was built here. 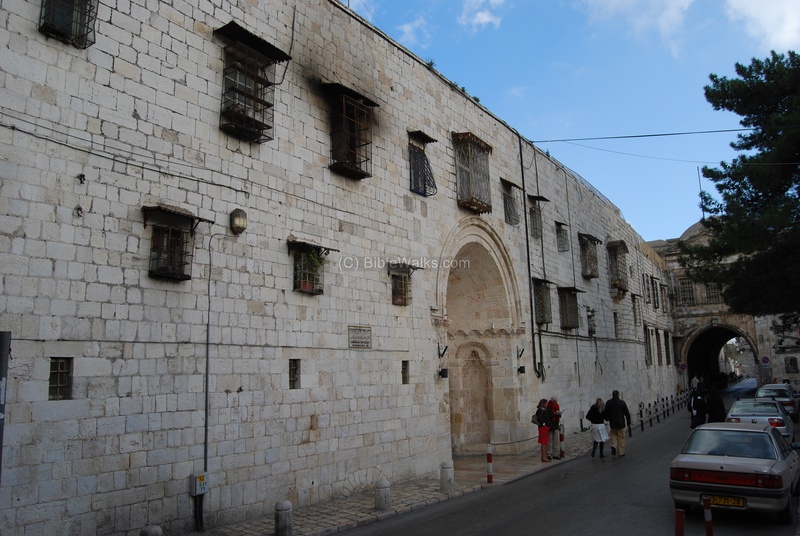 It was destroyed after the Persian and Arab conquest in the 7th Century. The church, dated to the 11th C, was built over the ruins of the Byzantine church. 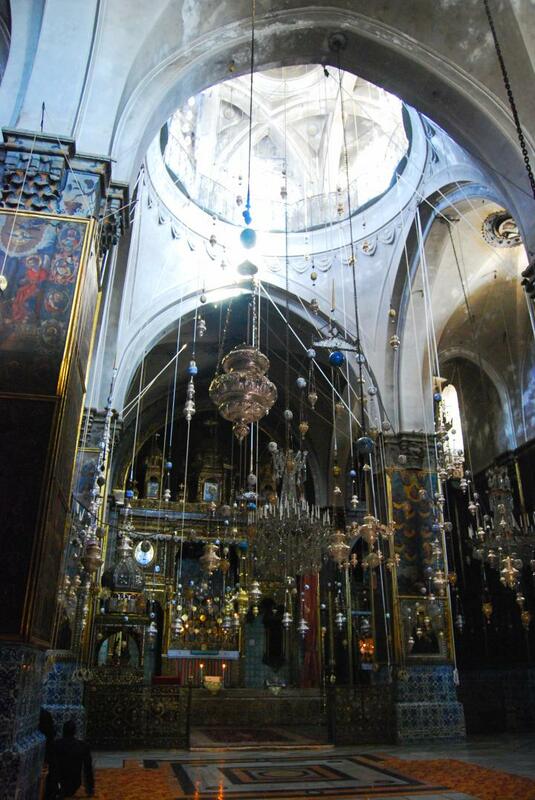 After the Crusaders' departure in the 13th C the church was first controlled by the Georgian monks, and later by the Armenians. 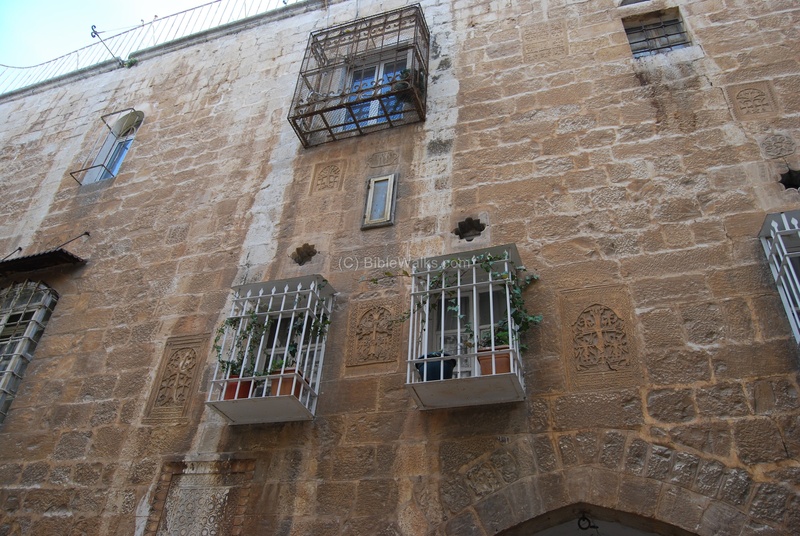 It became the base of the Armenian leadership in the Holy Land - the Patriarchate. During the 17th C the entrance of the church was blocked on the south side, and was changed to the western side as it is to date. The site is open to the public in limited hours. The site is located inside the old city walls and 100M north-west to Zion gate, along the external wall. The photo below shows a view of the Armenian orthodox Patriarchate road, in the section known as the Armenian Quarter in the western side of the old city. A view of the street, where the Armenian museum is located. 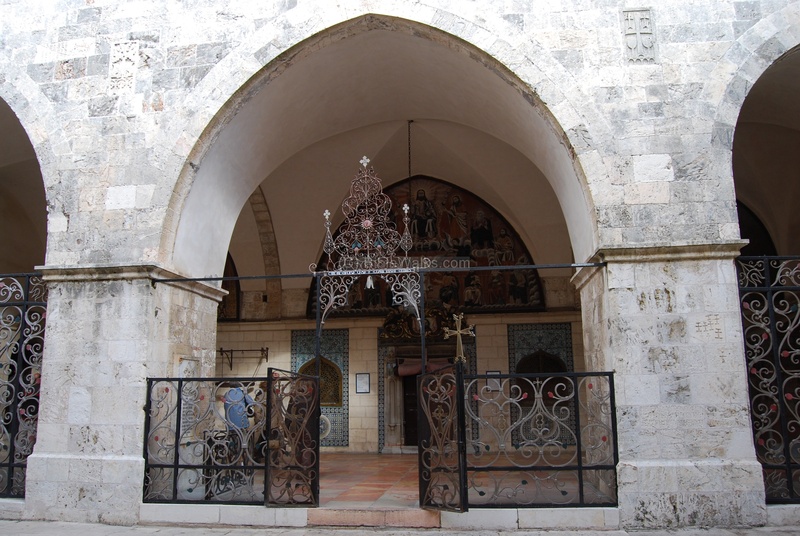 The entrance to the church is located along the Armenian Orthodox Patriarchate road, between the Zion gate and the Jaffa gate. 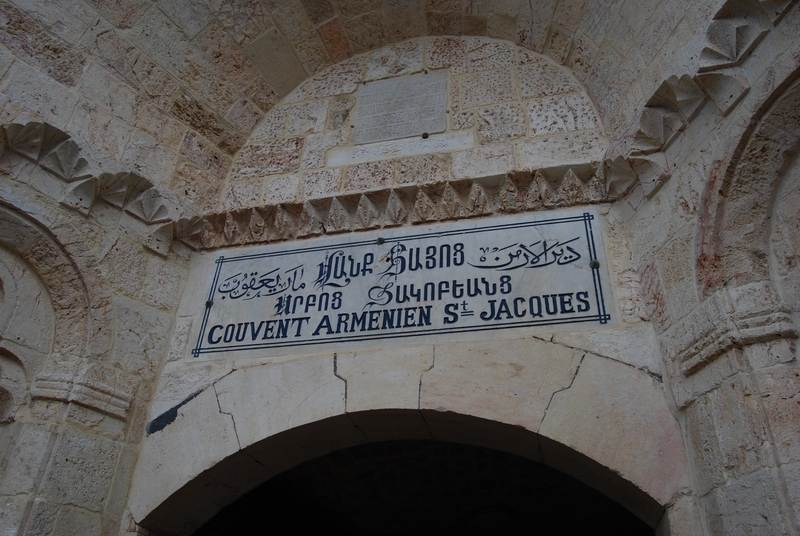 On top of the entrance is an Arabic and Armenian inscription dated to 1488, guaranteeing safety to the St. James Armenian Convent in Jerusalem. The entrance to the church is seen below. This is the western side, which was opened in the 17th C.
A detail of the paintings, ceramics and art works around the entrance. One of the decorated windows are seen below. 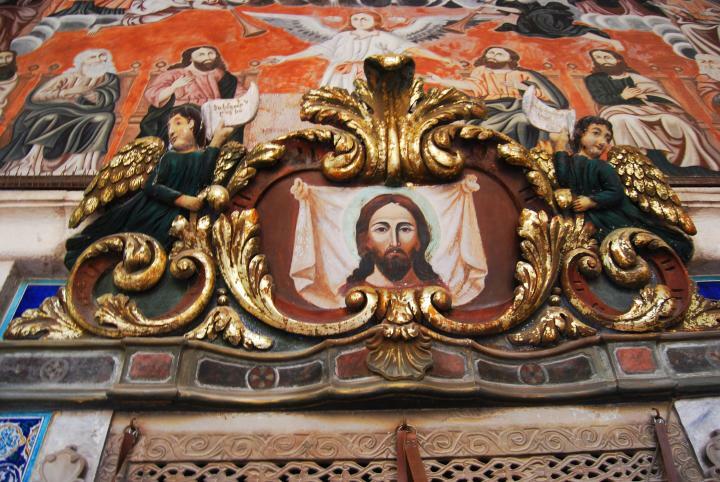 The Armenian art is based on a mix of metal, stone and glazed ceramics. A detail of the icons above the entrance is seen below. 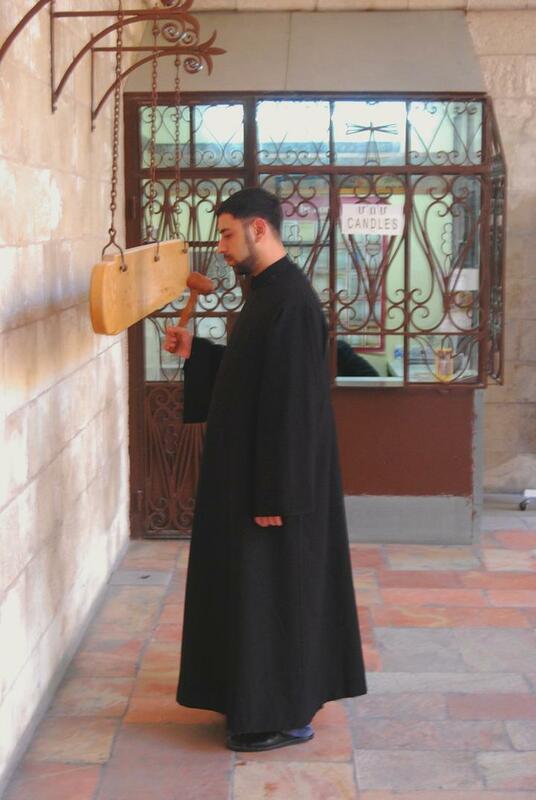 A call to the Friday prayer is seen below, using a wooden hammer and a plate of wood. The interior of the church is seen below. The Atrium, the open court before the church, is decorated with stone crosses and inscriptions seen embedded in the wall facing the entrance to the church. These are called "Katshkerim"
A detail of one of the inscribed stones is seen below. Another stone cross is seen below. 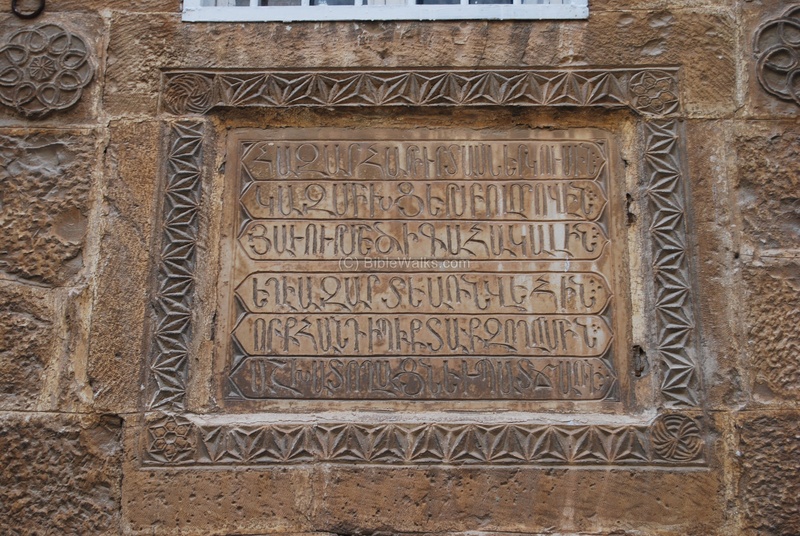 The Armenian alphabet, as seen on these inscriptions on the bottom side, is based on 38 letters. It was initially devised by Gregory the Illuminator, then formally defined in 405/406. The Alphabet started with 36 symbols, and later in the 12th Century 2 Greek symbols were added. On the side of the court is a tombstone and a ceramics painting. 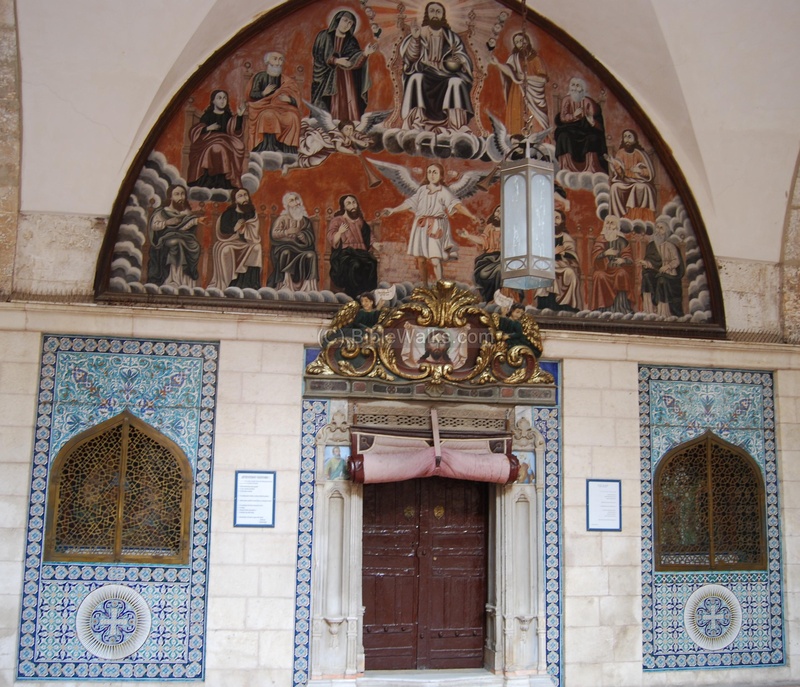 The traditional Armenian art is based on stone and metal, as seen in the design of one of the doors below. The Armenians keep a large number of illuminated manuscripts in the library. 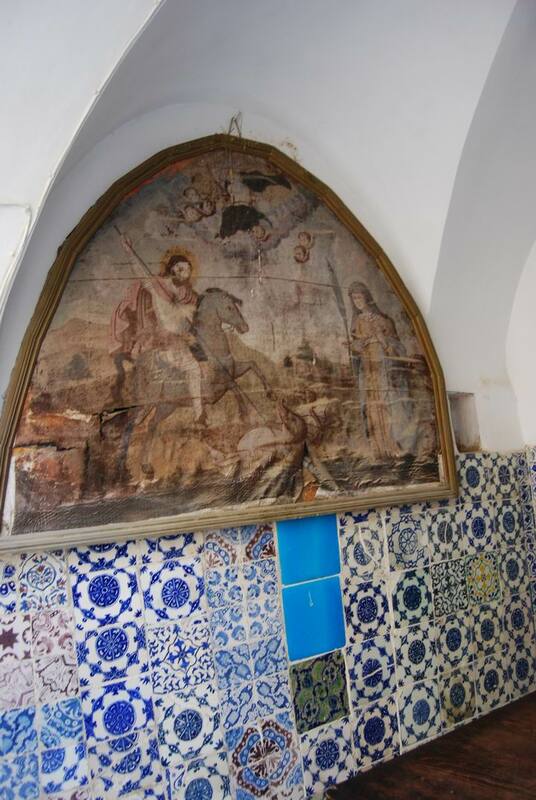 Over 4,000 rare manuscripts, some of them from the 13th C.
The photo below shows the entrance to the library, with the illustration of St. George slaying the dragon. 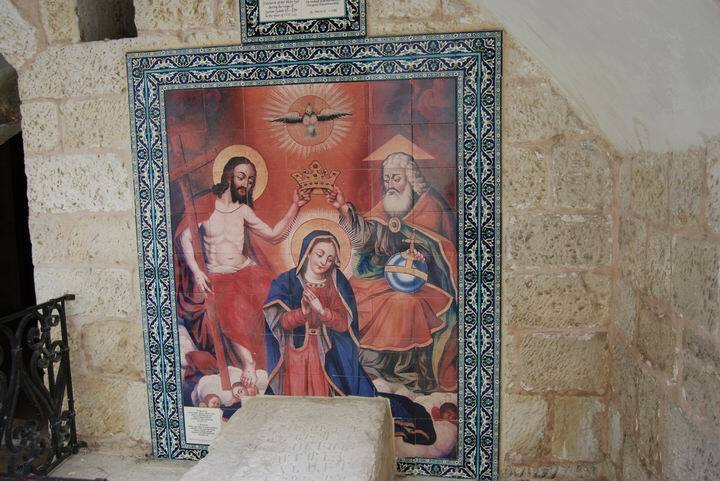 Below the ancient painting are decorations of blue ceramics, which are produced in Jerusalem by Armenian craftsmen. See more information on Armenian blue Ceramics. Inside the library is the beautiful Church of St Toros, seen below, also decorated by these beautiful glazed ceramics. The photos below show the central courtyard. 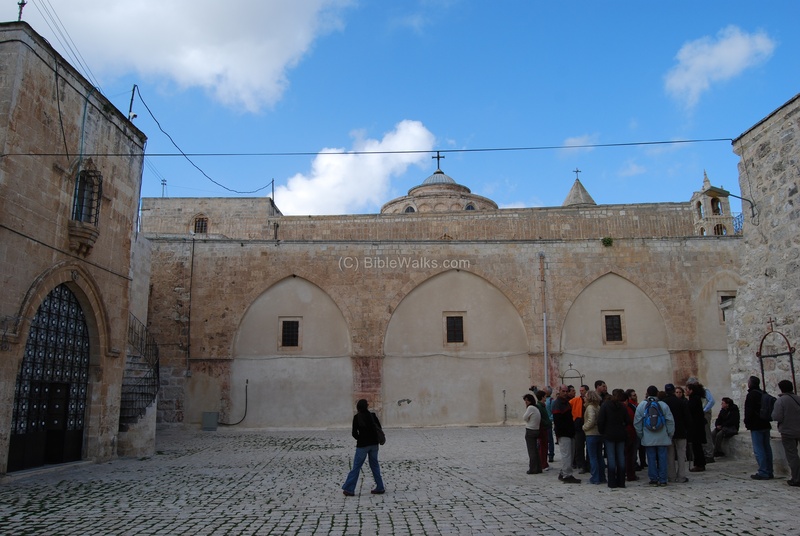 The original facade of the church during the Crusaders period was through these three arches, located on the southern side. 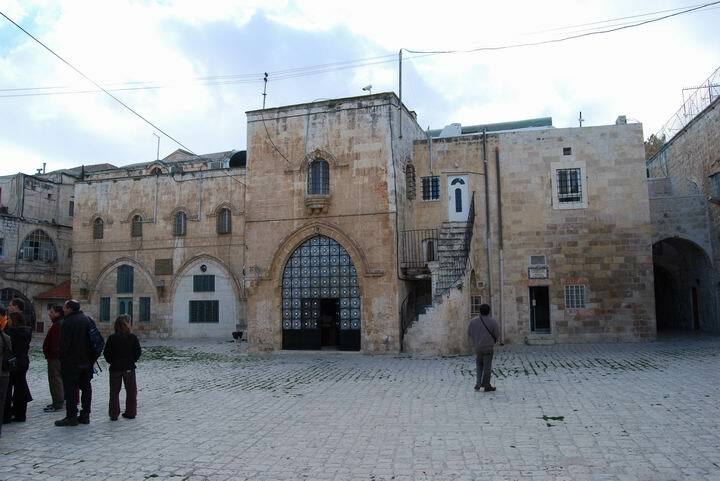 It was closed in the 17th C. The church, seen behind the center arch, is built from a single dome and is dated to the Crusaders period - the end of the 11th C.
Below - a view of the western side of the court, where the Armenian health center is located (on the right side). Another view of the western side of the court yard. 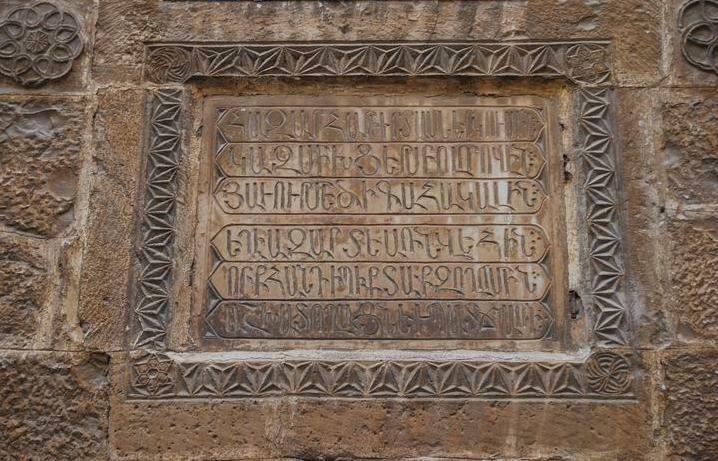 The style is typical Armenian: the design is a combination of geometric forms of metal, and stone. Inside an inner court is an old grape vine branch, as seen below. Although there is no a special interest in this location, it was worthy to add the photo in this collection. "Now about that time Herod the king stretched forth his hands to vex certain of the church. And he killed James the brother of John with the sword".